Once, king Shantanu of Hastinapur met a woman named Ganga, on the banks of the river Ganga. He wanted to marry her and she agreed to do, on the condition that he would never ask her any questions. 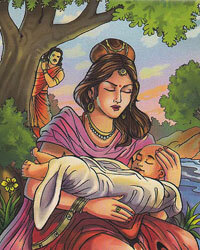 Soon, Ganga gave birth to a child but drowned him in the river. Shantunu was shocked. One by one, she drowned six more children. Finally, when she was going to drown her eighth child, Shantanu asked her why she was doing so. She said that she was the goddess Ganga under a curse to be born as a human. The children were vasus (demi-gods) and she was freeing them of the curse. But since Shantanu had stopped her, the eighth child would have to live the life of a human. Saying so, Ganga left. The eighth child grew up to be the great warrior, Bhishma.